It looks a little cramped, but it's just the way it is laying at the moment. I am at the decreases in the yoke, and I am not 100 percent sure I am doing them correctly, but they look okay, so I am going to go with it. I had planned yesterday to show you what was next, along with progress, but it just didn't happen. Maybe tomorrow, or the next time I post.Yesterday was another rough day, in part because I ate some things that I should not have. You know that feeling you get when you think something would taste so good, and it sounds great and you eat it, and it does taste good, until about an hour later, and not only do you regret eating it, but you also feel horrible from eating it? Yeah, that was me yesterday. But, today is a new day, and I will not make the same mistake again. 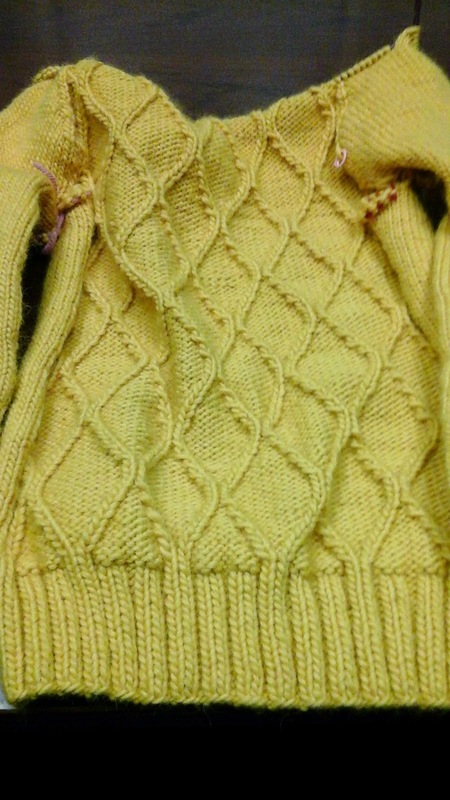 I am excited abut finishing this sweater, and to show you what is next. I think you will like it. What are you working on?